For many, stainless steel is just stainless steel. Most people assume that the stainless steel used in tonight’s dinner utensils is the same stainless that is used in wristwatches. The need for stainless is pretty obvious. Without the extra chromium added, unprotected carbon steel will rust which would certainly be unsightly for both the watch, and the wearer. 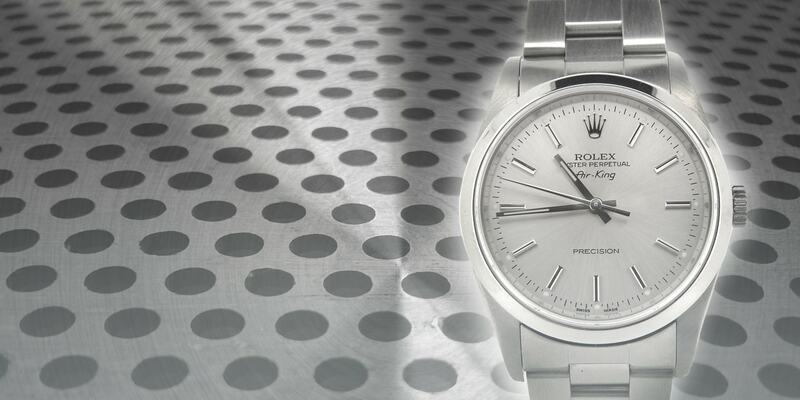 Most watch companies utilize 316L stainless steel in its watch cases, but Rolex utilizes a harder 904L that is both hard to obtain and hard to machine. Stainless steel comes in over 150 grades and mixtures, but 316L is the most prevalent in wrist watches. It is easy to polish, refinish, and does not oxidize. Most dive watches are made of 316L stainless steel because it is resistant to salt water damage, and it is easy to polish and keep lustrous. Even though Rolex used 316L until the early 2000’s, Rolex started to move to 904L in its cases because of pitting occurring in the case between the watch case and the caseback. Salt water from either diving or perspiration would seep into the caseback threads. Even though this salt water would not penetrate the case, it did start to pit the case and the caseback. A pitted case was hard to repair for there was no place for the caseback threads to grab and not enough metal to re-run a thread tap. 904L was initially developed to withstand strong reducing acids and highly resistant to chloride. Rolex smelts all its own metal, including its 904L stainless steel such to insure that there are no impurities in the metal when smelted. Rolex utilizes a slightly higher copper, nickel. and chromium content in order to make the stainless harder and can be polished to a highly glossy shine. The harder metal requires Rolex to design its own tools to fabricate cases. Starting in the mid-2000s, Rolex started utilizing 904L in its bracelets. Initially utilized for its watch cases, Rolex realized that the bracelet required an update to solid links, solid bracelet endlinks, and the addition of 904L for pitting resistance. The older, hollow-link bracelets use 304L or 314Lfor their metals. Some people consider the difference between 314L and 904L as being negligible and that Rolex’s divergence from the industry standard 314L is just another marketing point. But after seeing pitted casebacks and bracelet clasps, 904L certainly has its place.